Deepavali, the festival of Lights enthuses everyone. The festival is grandly celebrated all over the country. People wear new clothes, eat lot of sweets and celebrate with crackers. Last year, rains played spoilsport in Tamilnadu. On 8th Nov 2015, a depression laid centred near latitude 10.7° N and longitude 83.7° E, about 460 km southeast of Chennai, it brought torrential rains, and it kept raining for more than couple of days – then came the Dec 2015 rains, which inundated, threw city life out of gear. There approximately are a hundred languages spoken in Myanmar; Burmese, spoken by two thirds of the population, is the official language. Burmese is the native language of the Bamar people and related sub-ethnic groups of the Bamar, as well as that of some ethnic minorities in Burma like the Mon. The Mon are an ethnic group from Burma (Myanmar) living mostly in Mon State, Bago Region, the Irrawaddy Delta and along the southern border of Thailand and Burma. Mon were a major source of influence on the culture of Burma. They speak the Mon language. The legendary Queen Camadevi from the Chao Phraya River Valley, came to rule as the first queen of Hariphunchai (modern Lamphun) kingdom around 800 AD. Meteorological and other reports put that ‘Cyclonic Storm Kyant’ will unleash heavy rain and gusty winds on parts of eastern India later this week. The storm could put Diwali celebrations at risk from Friday through the weekend is what media says. Prior to Kyant, the northern Indian Ocean did not have a named cyclone since May. 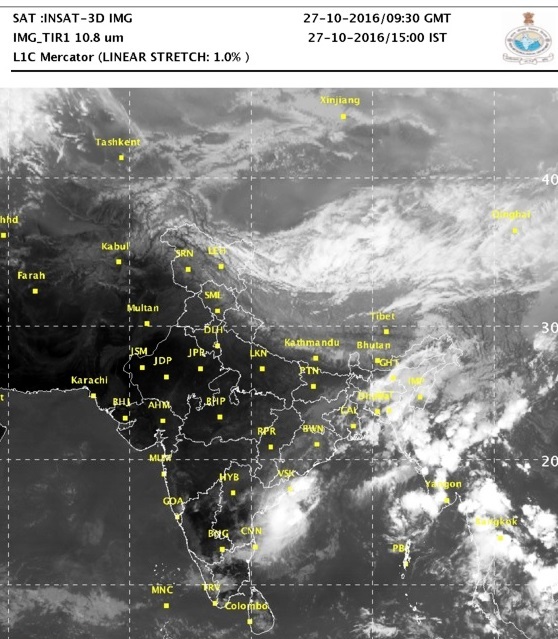 The storm will continue to track westward through Thursday before turning more to the southwest and approaching the southern coastline of Andhra Pradesh on Friday and Saturday. Conditions could worsen as the storm approaches the coast likely indicated to be between Ongole and Chennai when there will be gusty winds and rains when they make landfall. There could be flooding also – whether city is geared up, to meet the challenges – answer is known to all !! If the reports of India Meteorological Department (IMD) on Wednesday were to occur, Cyclone Kyant over the Bay of Bengal is unlikely to make a landfall, but the coastal regions of Andhra Pradesh, Tamil Nadu and Odisha may expect a wet Diwali. This means it will not hit the coast. A cyclone making a landfall usually wreaks havoc and causes damage to life and property. Kyant is expected to fade into a deep depression on October 29. The sea condition would be “rough to very rough” along and off south Odisha on October 27. Similar conditions would persist off the Andhra Pradesh coast during October 27 to 30, it is stated and fishermen have been advised not to venture into sea off the Andhra Pradesh coast from October 27. On Tuesday, the deep depression intensified into a cyclonic storm, Kyant, - a name that would mean ‘crocodile’ in Mon language about which you read in earlier paras. In the early days of meteorology, tropical cyclones were named by the places or things they hit or the days that it occurred. For example, the deadliest hurricane to hit the United States was the Galveston, Texas, hurricane of 1900. At least 8,000 people died in that storm. One of most intense hurricanes to occur in the United States was the Labor Day hurricane of 1935 that smashed into the Florida Keys. “Tropical cyclones” is the generic term for an organized system of convective clouds that rotate around an area of low pressure over tropical or subtropical waters. Tropical cyclones usually have catastrophic consequences, causing immense damage to life and property. Storms are seasonal phenomenon appearing in post and pre-Monsoon seasons in India. Prior to 2000, there was no practice of naming cyclones in the Indian seas. However, the 1999 cyclonic storm which ripped Odisha, triggered the necessity of naming storms. The WMO (World Meteorological Organisation) envisaged a panel, comprising of members from 8 countries, to assign names to storms forming in the Indian Ocean. These countries have prepared 64 names which have been in use on a rotational basis. The names of the countries are listed alphabetically and names given by them are used sequentially column-wise. Within this basin, a tropical cyclone is assigned a name when it is judged to have reached Cyclonic Storm intensity with winds of 65 km/h (40 mph). The next six available names from the List of North Indian Ocean storm names are : Roany, Kyant, Nada, Vardah, Maarutha, Mora. Today’s IMD report states that the deep depression over west central Bay of Bengal moved further west-southwestwards in past 06 hours with speed 17 kmph and lay centred at 0530 hrs IST of 27th October, 2016 over westcentral Bay of Bengal, near Latitude 15.7º N and Longitude 85.5º E, about 320 km southeast of Vishakhapatnam and 460 km east of Machilipatnam and 600 km east-northeast of Nellore. It is most likely to move west-southwestwards and weaken further into a depression during next 24 hours. The Depression over westcentral Bay of Bengal moved further west-southwestwards during past 06 hours with speed 10 kmph, and lay centred at 2330 hrs IST of 27th October, 2016 over westcentral Bay of Bengal, near Latitude 15.3º N and Longitude 83.0º E, about 260 km southsouthwest of Vishakhapatnam and 220 km east-southeast of Machilipatnam and 330 km eastnortheast of Nellore. It is most likely to move west-southwestwards and weaken further into a well marked low pressure area during next 24 hours. (i) Wind: Squally winds speed reaching 35-45 kmph gusting to 55 kmph is very likely to prevail along & off Andhra Pradesh coast during next 24 hours. 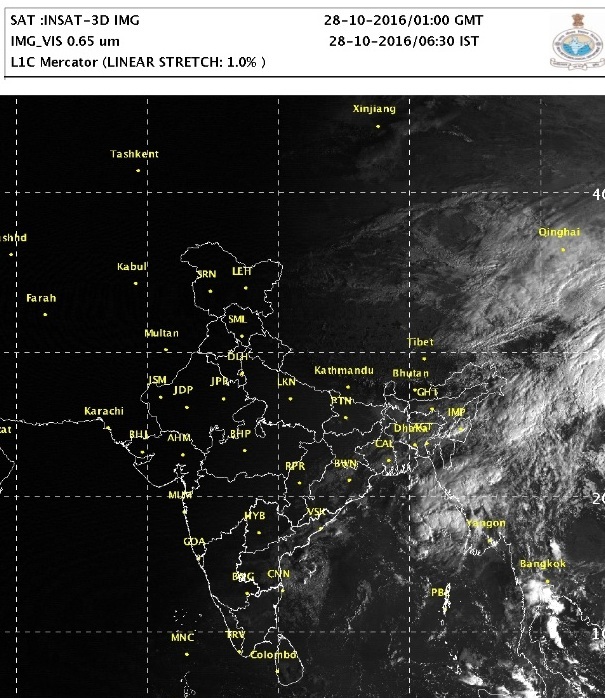 (ii) Sea condition: Sea condition will be rough along & off Andhra Pradesh coast during next 24 hours. (iii) Fishermen Warning: Fishermen are advised not to venture into sea along & off Andhra Pradesh coasts during next 24 hours.